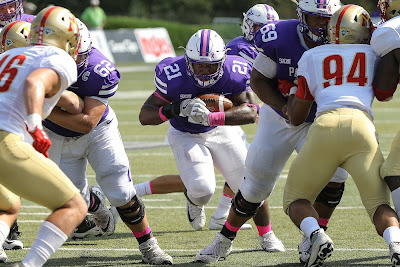 Furman fullback Kealand Dirks runs against VMI. Photo courtesy of Furman. While injuries continue to pile up in Furman's offensive backfield, so do the rushing yards. In Saturday's 42-10 win over VMI, the Paladins were without two of their top three tailbacks as Triston Luke (hamstring) and Devin Wynn (knee) sat out with injuries. Meanwhile, starter Darius Morehead ran four times for 20 yards in his only half of action as Furman continues to play it safe with its speedy freshman who redshirted last season after suffering a serious concussion in week two. Despite the injuries, Furman (4-3, 3-1 Southern Conference) put up a season-high 354 yards rushing on 61 attempts Saturday. It's the third consecutive game with at least 290 yards rushing for the Paladins, who've rushed for 952 yards during that span. The last time Furman had a three-game stretch rushing like that came in 2005. From 2006-16, the Paladins had at least 290 yards rushing in a game just five times - three against Western Carolina (2007, 2012, 2016) and twice against Colgate (2008, 2010). In addition to the running backs, Furman quarterbacks were also hampered by injuries much of last week. Starter P.J. Blazejowski didn't practice until Wednesday after suffering a knee injury at Chattanooga. Backup Harris Roberts was hobbled by a sprained ankle. Both of them looked just fine against VMI though. Blazejowski ran five times for 74 yards, while Roberts had 72 yards on two carries. Leading the way for the Paladins Saturday was fullback Kealand Dirks with 82 yards rushing and two touchdowns. Dirks, a 244-pound junior, has rushed for 283 yards over the last three weeks. "Kealand might have come as far as anybody on our football team. 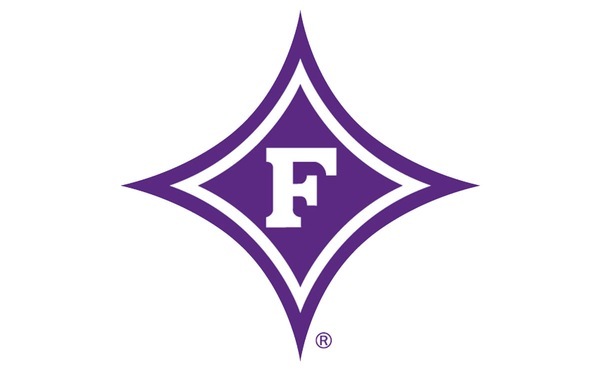 It's funny to watch him grow into a guy who kind of likes to practice, and that's not an easy position to play," Furman coach Clay Hendrix said. "We do inside drills every Tuesday and Wednesday and we run two plays, so it's not like we're fooling them with what we're doing. "He's always had really good running skills, but now he's just buying into everything - practice, blocking, toughness." Furman's running game will be tested this week against Mercer (4-3, 3-2), which has won three straight games. The Bears rank third in the SoCon - behind The Citadel and Furman - in rush defense allowing just 138 yards per game. Even though the Paladins have been putting up many yards on the ground lately, they haven't been putting the football on the ground. Furman hasn't had a turnover since a lost fumble in the second quarter against ETSU on Sept. 30. The Paladins have had 198 offensive plays since then, including 154 running plays without a fumble of any kind. In SoCon play, Furman has forced eight turnovers and committed just one. During the Paladins' three-game losing streak to open the season Furman was outscored 42-6 in the first quarter and 24-9 in the fourth quarter. In the four-game winning streak since, the Paladins have outscored opponents 49-10 in the first quarter and 35-25 in the fourth quarter. Nice article...The rushing stat from 2006-16 is crazy...Great research!